You really have no excuses for not sticking with Wednesday’s Alaska Baseball League extra-inning barn-burner, but if you left before the 14th inning, you missed a doozy—two managers trading punches in foul territory. 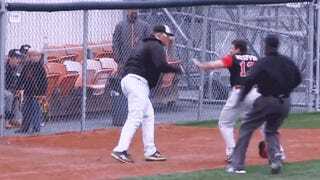 Anchorage Bucs manager Mike Grahovac was ejected for arguing balls and strikes, and as he walked off the field to the clubhouse, he exchanged words with Peninsula Oilers manager Kevin Griffin, who was coaching third base at the time. Grahovac bumped Griffin, Griffin shoved Grahovac, Grahovac threw the first punch, and Griffin connected with a perfect right hand that knocked Grahovac’s cap right off his head. Peninsula scored six runs immediately after the brawl, and won the game 9-3. If this was a motivational tactic on Griffin’s part, well done.